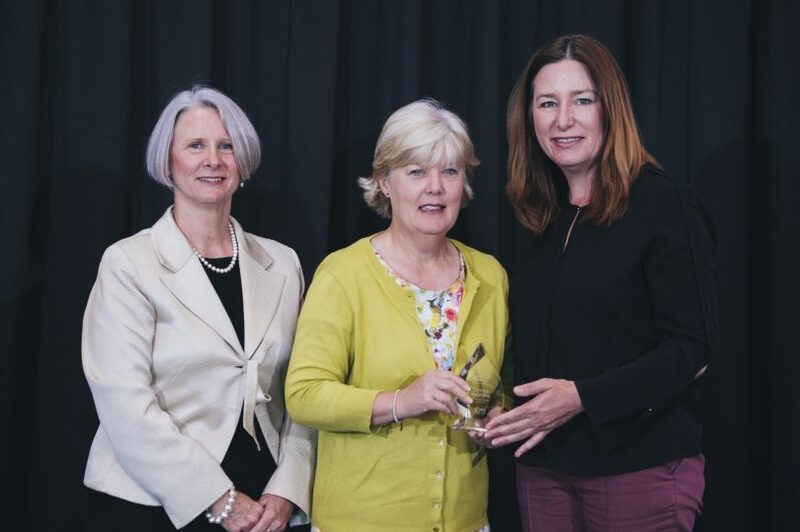 The ACT Public Education Awards at the National Museum of Australia: Primary School Teacher of the Year Vanessa Stephens, with Education Minister Yvette Berry (right) and Director-General Natalie Howson. Photo: Rohan Thomson/Education Directorate. Experienced Mt Rogers Primary School teacher Vanessa Stephens was given ‘gardening leave’ this year but has never been busier. Aside from teaching (a profession she has been engaged in for nearly three decades), Ms. Stephens is also passionate about gardening, the environment, and food. This passion was recognised when she was hand-picked by her principal to lead environmental education and gardening in their school ­– including establishing the ­Stephanie Alexander Kitchen Garden Program ­– and driving Mt Rogers’ transition to a ‘Fresh Tastes’ school. Recently she lined up to accept the award for Primary Teacher of the Year at the 2017 ACT Public Education Awards after a release year that reinvigorated her career. Ms Stephens said she had always incorporated her interests into her class teaching but now she got to do it all week across the entire school. “Throughout my career, I’ve always tried to make things new and interesting for me as well. If I’m finding it interesting then they will too,” she said. Her work has enabled Mount Rogers Primary School to attain ACT Smart School’s 5-star accreditation for recycling, energy, water, biodiversity, and curriculum. Children plant, grow and harvest food; cook nutritious meals using this produce, and learn about environmental sustainability. Recipes used in class are shared with families and excess produce from the gardens is donated to the canteen or sold to members of the community by students. She also runs a lunchtime gardening club and a ‘Green Team’ who monitor energy use and waste across the school on a daily basis, as well as encouraging parent participation in whole school events such as ‘National Tree Day’, ‘Clean Up Australia Day’ and ‘Earth Hour’. The ‘Fresh Tastes’ team successfully implemented all six priority areas into the school, resulting in a canteen serving healthy food, implementation of the ‘Food and Me’ nutrition curriculum and participation in the Stephanie Alexander Kitchen Garden Program. Ms Stephens is also working with students and community groups to develop a bush tucker garden. She said students across all age groups responded enthusiastically to her work, particularly gardening and cooking. “Every time they see me they ask, ‘are we cooking today’? It’s a highlight for them,” she said. The sustainability message runs through everything they do, from kindy kids learning about water to older children tackling waste issues. “It’s about setting the groundwork, a basic understanding of what it means to be looking after the environment. It’s not that big picture stuff, it’s what they can actually do,” she said. Her work also ticks many curriculum boxes from mathematics to languages to art. She has also motivated parents who volunteer in the garden and kitchen, and even supply seedlings for the children to plant. Even a grandparent is heavily involved in the bush tucker garden project, creating plans from ideas cultivated in the classroom. “You can get a lot of information from the internet, but schools are about learning how to think. You’re not fed information, you’re actually taught how to think,” she said. Confessing that this is probably her swansong, Ms Stephens hopes to continue in the role next year and see out her career sowing sustainability seeds across the Mt Rogers school community. Outstanding School Leader of the Year: Helen Witcombe, Deputy Principal and Manager of Tuggeranong Sustainable Living Trades Training Centre. What do you think about initiatives like the ‘Fresh Tastes’ program and the ‘Stephanie Alexander Kitchen Garden Foundation’ program? What else can we do to encourage schoolchildren to engage in gardening organic produce? Let us know your thoughts by commenting below. Why isn’t physical education viewed as important in our primary schools?